On Thursday night, ~James Franco~ was spotted at Betelnut with friends. They had dumplings and scorpion bowls before heading off to a special screening of The Iron Lady. Lovely ladies: Angie Dickinson with Park Tavern owner Anna Weinberg. 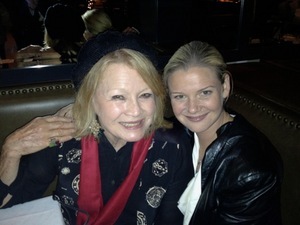 A fabulous sighting at Park Tavern on Friday night: the incomparable ~Angie Dickinson~ came in to dine with the glamorous Denise Hale. I know it’s not polite to discuss a lady’s age, but when you look that fab at 80, well, you gotta say something. Go Angie. Yeah, rough weekend for football fans. I was amused to learn on Friday night that the owners of the 49ers and the New York Giants dined at different restaurants in the Delfina Group (Delfina and Locanda). And on Saturday night, the owners and agents of the Giants team dined at Park Tavern. 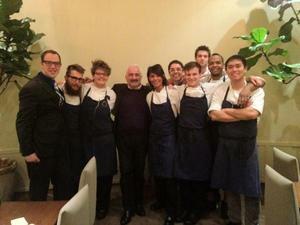 Guy Savoy with the Atelier Crenn crew. Photo via Facebook. I’m sure the team at Atelier Crenn was beyond thrilled to cook for chef ~Guy Savoy~. Oh wait, here’s a picture of the crew. Yup, beaming. Chef ~Robert Irvine~ (of Food Network’s Dinner: Impossible, Worst Cooks in America, and Restaurant: Impossible) tweeted about having a good time at Havana in Walnut Creek. My tipster says, “he is in the area doing a remodel of a restaurant in Benicia,” which according to his tweets is Pappas Restaurant.